A second change at love does not come often, if ever. For Vincent and Maeghan it was something that neither of them expected. Maeghan had been happily married to her high school sweetheart and fireman for three years and was seven months pregnant with her baby boy when a brain tumor took his life 10 days after it was detected. Meaghan wrote” I was so incredibly broken. Not only had I lost the person I’d been in love with since before my 18th birthday – my dreams for the future had vanished, too. I lost the man who was supposed to be my forever. It felt like my previously beautiful life just evaporated into thin air. Suddenly I was a “widow” and a “single mom” and was mentally preparing myself to spend the rest of my life defined by those terms. I hoped to find companionship again one day, but had also accepted that it might never happen – and if it did, it would never come close to the love that I’d lost. I told myself I could do it alone and that Mason would never need a father figure. My pain was too fresh at the time to realize that if I were lucky enough to find a man willing to embrace Mason as his own, it would be a blessing. I couldn’t see past the fog of my current reality. At some point, someone suggested that I try joining a Facebook support group for widows and widowers. I did, but the group consisted of thousands of members nationwide, and I quickly found my feed being flooded with long-winded vent sessions. It was impossible to keep up with every post, and I would just ignore and scroll through most of them. One day, however, a short and straightforward question caught my attention – a man asking what other members had done with their wedding rings. This struck a chord with me, as I had been struggling with the same issue. I was unable to even wear my wedding rings while Ralf was sick since I was so bloated, and once Mason was born and the rings fit again, putting them on was just too painful. I decided to reach out to him. Maeghan and Vinnie worked with Intimate Weddings of Orlando to make their low key wedding perfect for the two of them. 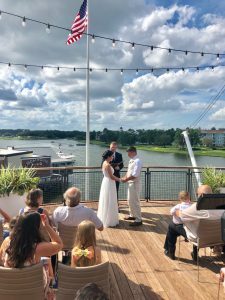 On the third floor deck of Paddlefish at Disney Springs in the Walt Disney World Resort the couple said their “I dos.” With very close family and friends it was a celebration of the broken road they had traveled that brought them to this point in their lives. Edmund Rhodes from Rhodes Studios Photography and Video came and photographed and videoed the beautiful intimate ceremony; from the time the couple arrived through their first dance and into their reception. Lesley from Flowers by Lesley crafted a beautiful cream color bouquet and boutonniere per the request of the couple. Rev. Glynn Ferguson of Sensational Ceremonies worked with Vinnie and Maeghan to create a custom ceremony that spoke of the road they had traveled to get to their Happily Ever After. After their vows were said, through many tears, the couple walked down the aisle as husband and wife. Their first dance was “Tell Your Heart to Beat Again” by Danny Gokey.